When the magpies are swooping! 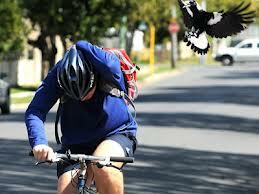 It is magpie swooping season here. That means that the magpies have babies in their nests and they don’t like things that go under them, including people on bikes!! My 12 year old son was riding home from his tennis final and he got swooped! Not just swooped, but hit on his bike helmet and not just once but 3 times! If you have ever had this happen to you, you would understand that it is actually quite frightening. Noah went down a side street, found a man who was washing his car on the front lawn and between tears asked him what to do! He kindly told him to wave his arm above his head and keep riding! So, off brave Noah went. Fortunately the magpie had moved on and it didn’t swoop again! Needless to say when Noah arrived to the safety of home he shed a few more tears, had a big hug and we discussed the situation in a positive light. ie how well he handled it and that he had what it took to keep going. As I thought about swooping magpies and this quote I realised the amazing situation we are in to help kids and friends to look on situations in a positive light. That is not to say that we brush their situation aside, but perhaps we can help them as we listen to see some positives? When kids talk to us, sometimes they just need to be able to see another side to the situation. Oh dear Noah! Not good! When I first rode my bicycle 25km to Laidley church last year along the quiet country roads at 7am, I didn’t know it was the breeding season for magpies! 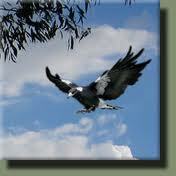 So they dive bombed me all the way from the eucalypt trees . It would have happened about 10 times ! Eventually I picked a tree branch and as they swooped down in a very scarey, angry manner, I tried to shoo them away. In a bike shop last week, I asked a cyclist for remedies! Paint eyes on your helmet!! Fix an antennae to your helmet. Etc. “does anything work?” He said “No”! He told me how one magpie crash-landed on his back as he was cycling and on another occasion, the magpie’s beak nipped his ear! So Noah for a project, I think you should do some research on what a cyclist can do? Maybe, invent something . Next time, I ride, I going to take an umbrella! I wonder how long before the magpie breeding season is over ! Keep this trendy Nana informed! Thankyou for all your advice. I’ll try do a bit of research. Great blog mum. I like the story of me being swooped. thanks for providing the material for my blog! Magpie attacks are quite vicious . NSW ambulance said injuries could range from pecks to the head and pecks to the ears, to more serious outcomes. The best response is to keep calm. Thanks for the Fun Fact! Great story! Andrew and Matthew were swooped on their bikes last weekend, and the maggie drew blood on Andrew’s ear, just like Ben’s!